Margaret Dykens (SDMNH) shows Margaret Pope and Jan Bell (TCSS) Valentien’s paintings of some Sonoran Desert plants. In this painting of Prosopis pubescens it is possible to see the mounting sheet for the artwork and the binding holes from the leather portfolio. Margaret Dykens with one of the leather portfolios made for Ellen Browning Scripps for storing Valentien’s paintings. 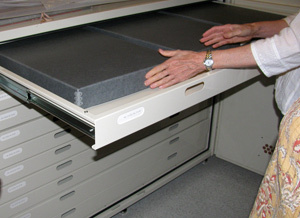 The paintings were removed from the portfolios and placed in archival storage boxes. Valentien’s paintings are now stored in custom-made storage cabinets instead of the original leather portfolios. After seeing the remarkable works in the illustrations collection at the University of Arizona’s Herbarium, and knowing that these illustrations have only recently become available for viewing after many years of being confined to cardboard boxes, I have to wonder how many other troves of art are hidden away in museums, herbaria, publishing houses, and libraries—unseen for the most part, uncatalogued, and maybe languishing in poor storage conditions. Such was the case with the collection of paintings by A. R. Valentien held by the San Diego Natural History Museum (SDNHM) that was unknown in the world of botanical art until recent years. Albert Robert Valentien (1862–1925) began his career as a painter and artistic director at Ohio’s Rookwood Pottery, America’s premier pottery of the Arts and Crafts movement. His work there is well-known and can be found in prestigious collections in Europe and the U.S., yet works from his second career, flower painting, were until recently not known outside of California. Valentien (originally spelled, and pronounced, ‘Valentine’) was a trained artist but had with no formal botanical training. Floral themes were common at Rookwood, and Valentien would have had considerable experience observing and rendering flowers from nature. But it wasn’t until 1899 when, waylaid by illness during a trip to Europe, he began drawing flowers as artistic subjects in their own right. In 1903 he visited San Diego and found the plant life there irresistible. During his eight-month stay, he produced and exhibited some 130 botanical paintings. The area was so enticing that he and his wife Anne, also an artist, soon left Ohio for California with the intention of starting a pottery studio in San Diego. 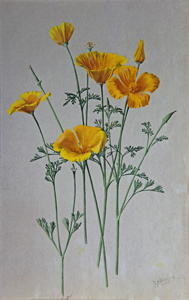 Luckily for the world of botanical art, Valentien was pulled away from the pottery studio to work on a commission from Ellen Browning Scripps to paint California’s wildflowers. From 1908 to 1918, Valentien traveled throughout California painting plants—wildflowers as commissioned, and also trees, ferns, grasses, and cacti. At the end of ten years, the artist had completed 1,094 paintings representing 1,500 species. The works were painted on 13” x 20” sheets of light gray paper with gouache, an opaque watercolor that, unlike transparent watercolors, gives a vibrancy and brightness to the plants, particularly white flowers, such as the splendid matilija poppy, one of Valentien’s recurring subjects. 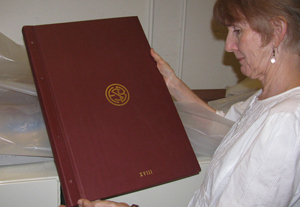 All of the paintings were bound in large leather portfolios and delivered to Scripps as completed. The artist’s hope had been that these paintings would eventually be published and his name established as a botanical artist. In the end, however, Scripps decided that publication would be too expensive, a most disappointing outcome for Valentien after so much intense effort. After completion of the floral commission, he turned to landscape art for a few years and in 1925 died unexpectedly from a heart attack. Upon Scripps’ death in 1932, the paintings were given to San Diego Society of Natural History where they remained in the research library of the San Diego Natural History Museum (SDNHM ) in their large leather portfolios, unpublished and seen only by a few. In 1999 one of the museum’s docents, after seeing these amazing works in the museum’s library, approached Margaret Dykens, director of the research library, with an offer of funding to make the collection more widely available. Eleanor and Jerome Navarra sponsored the immense project of photographing, cataloging, and appraising the works, creating archival conditions for storage, and finally, exhibiting a selection of them. Eighty of the works were exhibited at SDNHM in 2003 after which The Irvine Museum funded an exhibition of the works that traveled throughout the U.S. from 2005 to 2009. It is well worth the time to seek out these extraordinary works. A book funded by The Irvine Museum and SDNHM was published to accompany the exhibition. Plant Portraits: The California Legacy of A.R. Valentien includes a collection of essays with images of 325 of Valentien’s paintings. A number of works from the exhibit can also be seen on SDNHM’s website. 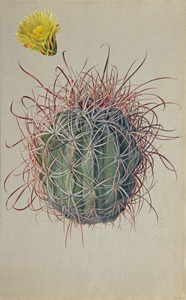 In 2012, when planning and gathering artwork for the exhibit, Botanical Art of the Sonoran Desert: Past and Present, TCSS members Nancy Reid, Jan Bell, and Margaret Pope went to the San Diego Natural History Museum to look at the watercolor drawings of A. R. Valentien archived in their Research Library. Although the collection documents California’s botanical diversity, many of the 1,094 paintings are of plants native to the Sonoran Desert and would have been appropriate to include in the exhibit. 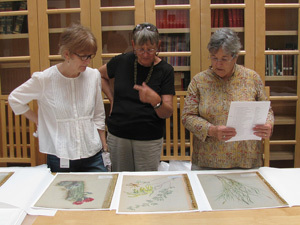 Margaret Dykens, Research Library Director, showed Nancy, Jan, and Margaret paintings of plants native to the Sonoran Desert. 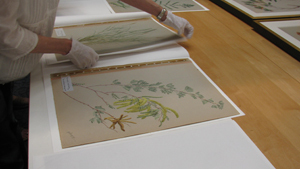 Because of the Florilegium Program’s work with archiving the U of A Herbarium’s collection of botanical illustrations, they were very interested in seeing how the Valentien collection was archived. Originally the paintings were mounted on sheets of linen paper and encased in a number of leather portfolios. Since the leather portfolios were not of archival quality, the paintings were removed from the portfolios and stored in archival boxes. These boxes were then stored in cabinets specifically designed to hold the boxes, just as our program has done with the U of A Herbarium collection. This appeared in the March 2015 issue of The Desert Breeze, the monthly newsletter of the Tucson Cactus and Succulent Society.